Good Afternoon all, it’s Liza the Owner of The Wandering Path I’ve been battling worries, body sicknesses and so many empathic emotions from others the past few weeks but today….at least for a brief period of time (as I write this it is more settled) things seem to feel better…and lighter and I only hope that it continues. I put on movies that remind me of things (Practical Magic the one that truly set off goose bumps and a sense of calm); consulted my pendulum; lit a candle and burned some sage…I also made sure to put on my “lift my mood heal my face blend” and even though the rain falls and winter weather seems to be holding off the foggy future no longer feels so daunting but rather as if the Winter Solstice has started to open at least a path to wander ahead towards things that I need to learn, discover, and that the outlook is again hopeful. –Blessings to you all & here is to hopeful ways in the coming year. 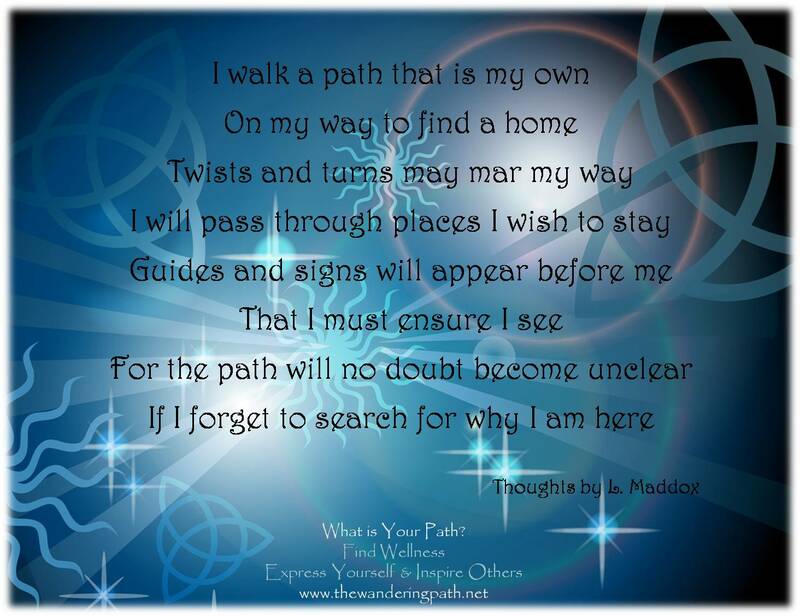 Liza M; Owner, The Wandering Path LLC.